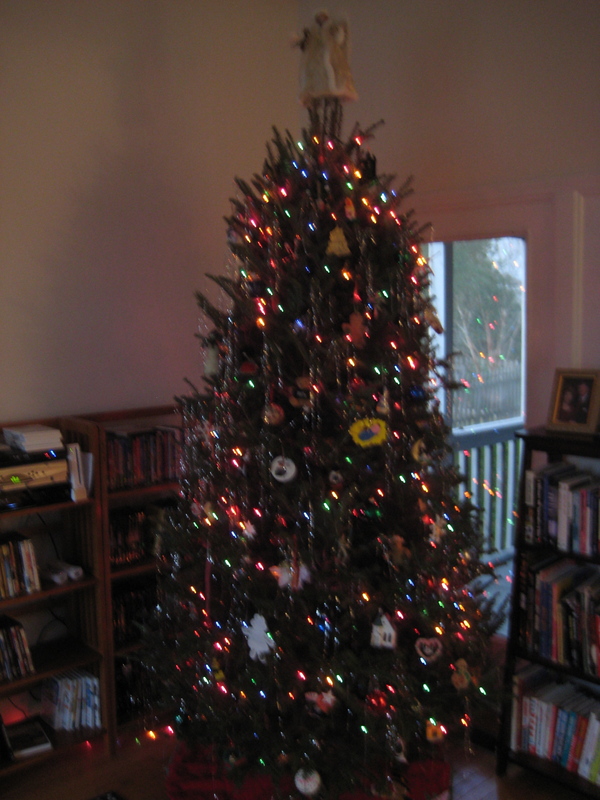 When putting the lights on your tree, don’t wrap the entire string around and around the entire tree. This method, as we all know, results in a tangled mess — both the lights and yourself — during both the decorating and un-decorating of the tree. Instead, look at your tree and mentally divide its cone shape into two to four vertical segments. In other words, you will have several tall “triangles” of space from top to bottom around the tree. Using one string of lights for each segment, hang the lights in a zig-zag fashion (think of a compressed “z”), left-to-right, from bottom to top (starting with the plug end near the outlet), then connecting the next string and going top-to-bottom, continuing with one set of lights per segment, zig-zagging horizontally while moving up or down vertically until each segment is covered. The lights will still look like they are strung all the way around the tree in nice horizontal rows, but it is easier to hang the lights this way, and much easier to take them off; just pull off one section at a time instead of unwinding the entire tree. Sarah put the lights on our tree in a way similar to what you recommend. I didn't like the way they looked so I took them off and put them back on by wrapping them around the tree. You probably aren't surprised. Sarah put the lights on our tree in a way similar to what you recommend. I didn’t like the way they looked so I took them off and put them back on by wrapping them around the tree. You probably aren’t surprised.